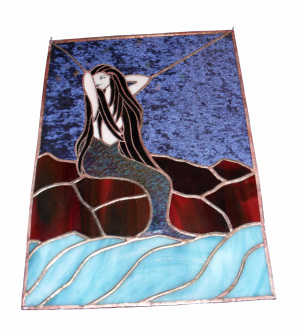 Sarah Jackson Creations produce unique stained glass in Cumbria (Wigton). I am Cumbrian born and bred although I did move away to university, (I moved back in 1999) where I studied Sports Science in which I have an HND. Although I was interested in art I struggled to get my ideas down on paper and I was never satified with the results until I decided to enrol in stained glass evening classes in September 2002, I continued to attend classes for 3 years, and have been teaching since 2008. Since then I have continued to develop my technique and increase my portfolio. Initially I used a pattern book but soon went on to develop my own patterns as the glass could add the details I could never get right. I produced my own pattern book which is available on CD called Cute Critters and Kiddie Creations and then went on to produce designs that were influenced by one of my other interests and now have a line of Belly Dance inspired stained glass items, I specialise in the Tiffany (sometimes known as copper foil) and Leaded Light techniques, although I do some Staining and Fusing work. Commissions are accepted and I can produce patterns using existing photo's, existing drawings, or from a clients description of things they would like included. All items are handcrafted by myself, and are therefore totally unique pieces of art. Click on Clothing from menu then on the picture. I now have a group on Facebook: Stained Glass by: Sarah Jackson Creations, this will enable you to keep up with regular updates. Follow the links page to join. All contents are protected by Copyright. Please see Terms and Conditions. Turn Artistic Hobbies Into Money-making Art Fair Exhibitor Careers! Ebooks Are Stuffed With Unique & Valuable Info For Aspiring Artists. First Ebook Product Ever From #1 Ranked Google Site For Art Fairs!